Another variant of a grid Expert Advisor. The first market order is opened by the trader manually. For that purpose a panel with "OPEN BUY" and "OPEN SELL" buttons is displayed on the chart, the volume of the first order is specified in the Lot parameter of the EA's settings. Once the price moves a specified distance away from the opened deal, a pending order is placed. The pending order, from which the price "runs away" on a certain specified distance, is dragged towards the price. 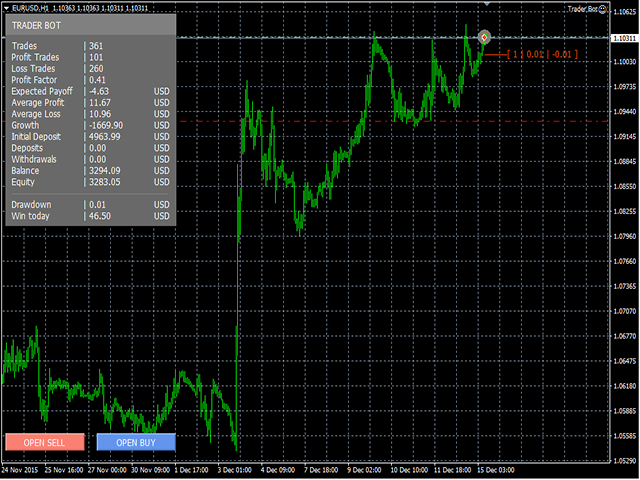 The parameters of the trailing stop for the pending order are easily adjustable. When any of the pending orders triggers, the EA places a new, same pending order at a specified distance from the last opened order, but with a changed lot. The number of pending orders to be placed can be limited by an adjustable parameter. Pending order placement step and the size of the trading lot can also be adjusted. The EA can be used in conjunction with another EAs, the order grid is tracked by the magic number. Adapted for 4-5-digit quotes. Recommended currency pairs: EURUSD, GBPUSD, AUDUSD, USDJPY, USDCHF, USDCAD, NZDUSD, EURJPY, EURGBP, EURCHF. Deposit – no less than 500 units of base currency per pair at an initial lot of 0.01. Important! Enable the visual mode to test the EA in the strategy tester. It should be clear that this is not the Grail, but merely a program. Where and how to use it, on which markets and in what situations, is for the trader to decide, relying on his\her experience and knowledge. Make sure you test the program in the strategy tester in visual mode and understand all the settings before you make the purchase. If any questions come up during testing, feel free to contact me. I hope, this product will be helpful. Your feedback is welcome. TimeStart – EA operation start time, during which the EA is allowed to place new orders of the grid. ButtonSell – "OPEN SELL" button color. IT'S A MUST FOR ME AFTER USING IN REAL ACCOUNT.CONGRATULATIONS!!! What do you mean one pair! When you change magic number you can take more pairs!